Are you ready to live on the beach but still have the convenience and comforts of big city life? A hidden paradise like Lido Key may be just the place with its wealth of lush tropical landscaping, art galleries, upscale boutiques, and distinctive fine dining featuring international cuisine. These delights and more are mere minutes from scintillating downtown Sarasota and just across the famous Ringling Bridge. In 1917, entrepreneur John Ringling of Ringling circus fame purchased the real estate at Lido Key. In 1925 he started construction on the bridge connecting it to downtown Sarasota. Lido Key is a barrier island gem situated just west of renowned St. Armands Circle. Bordering Sarasota Bay, the Gulf of Mexico, and New Pass, its picturesque surroundings craft the perfect environment for the spectacular, chic condos for sale at Lido Key. The combined ambiance of Lido Key and St Armands Circle feature old style Florida flavor together with powdery white sand beaches. It’s a quick trip anywhere as St Armands Circle and Lido Key are connected to the mainland and to Longboat Key by bridges. 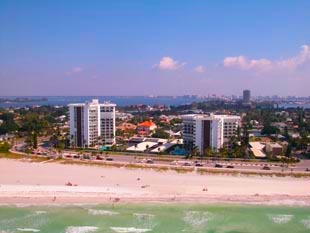 Lido Key condos are some of the finest in the Florida real estate market and the condos for sale in St. Armands Towers are felt to be some of the most iconic Lido Key units available. For those who yearn to be in close proximity to the action of the “Circle”, St Armands Towers is situated at 1 and 101 Benjamin Franklin Drive. This means the 2 buildings in the St. Armands Towers complex are the Lido Key condos closest to “The Circle.” It’s a simple walk to awesome shopping, eclectic fine dining, a lively bar with friends, or just to grab an ice cream. 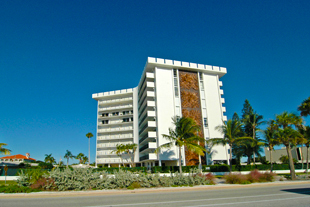 Constructed in 1968 the 192 unit development presents residents of St. Armands Towers with sensational Gulf of Mexico vistas. The outstanding amenities include gym, resort-style pool and pool deck, sauna, social room and an excellent concierge service. 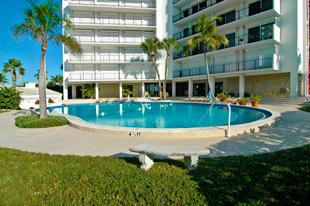 The 2 bedroom, 2 bath residences usually measure 1,275 square feet and are generally priced in the low $600,000 range. The more spacious 3 bedroom, 3 bath units run around 2,880 square feet with price points getting close to $2,000,000. The units facing the gulf provide fabulous evening sunsets while others boast far reaching Sarasota Bay views and the gorgeous skyline of Sarasota. It’s mere steps to the beach and South Lido Beach Park is a bike ride away. This beautiful park reserve features cool, tree laden picnicking areas along with a much used kayak and canoe launch. These and many more recreational activities are available to keep you and your family busy as there is excitement here for everybody. Below are all of the current real estate listings available for sale at St. Armand’s Towers.